I hope the sun is shining in your part of the world, it is struggling to pop out here. 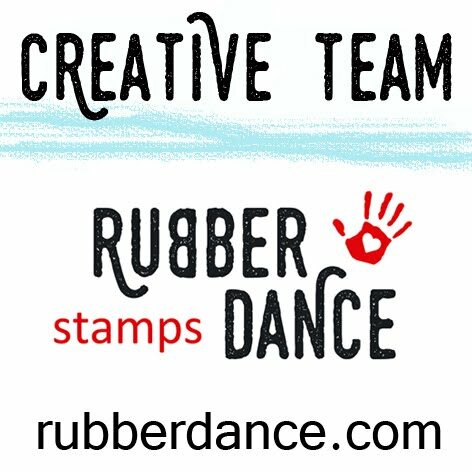 Today I have an inspiration card for you that is for the July Challenge at Rubber Dance Stamps. This month we ask you to either follow the colour part of the challenge which is Black & White plus another colour, or Use Wings/Feathers. I’ve been thinking of having the elephant, from African Animals, walking through a forest of trees, then at the last minute I added the lion (from the same set) laying in wait for the elephant and added some words from the Take The Plunge stamp set. I must have been in a mischievous frame of mind. When you play along with the Rubber Dance challenges you have a chance to win 12 Euro to spend any way you like at the Rubber Dance shop.